Fresh Arts on Referral run by North Bristol NHS Trust, is an ‘arts on prescription’ programme for patients living with cancer, chronic pain and dementia. A transformative arts project at the Royal Glamorgan Hospital, which prepares to open a new Y Bwthyn Macmillian Palliative Care Centre in 2019. An ambitious arts programme for the Royal Sussex County Hospital 3Ts redevelopment which aims to create a welcoming therapeutic environment, conveying compassion and care whilst establishing a strong visual identity. Creative and Credible evaluation training explores key principles and methodologies for evaluating arts for health and wellbeing programmes. Using a Theory of Change model, it supports participants to articulate project outcomes and impacts. 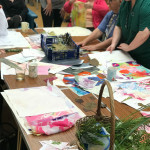 Willis Newson has been working with North Bristol NHS Trust’s arts programme, Fresh Arts, to set up Fresh Arts on Referral, an ‘arts on prescription’ programme for patients living with cancer, chronic pain and dementia. Blurring boundaries between inside and outside, connecting with nature and feeling safe are all part of the inspiration for a transformative arts project in Wales.